In 1943, Katharine Cook Briggs and her daughter Isabel Briggs Myers created the famous Myers Briggs Type Indicator (MBTI) personality test. You can download and take the test below or take the online test. The pdf will also give you the in-depth details on your personality type. Want to learn about other personality tests? Click here to find out! Inspired by renowned Swiss psychiatrist Carl Jung, they devised a questionnaire that would help identify a person’s psychological type. Get your personality type instantly by taking the online test below. Want to know how your personality can impact how much money you make?Click here to get free training on becoming wealthy and financially free! CLICK HERE to Instantly Download For Free Your SMART Personality Type and In-depth Analysis! This personality test gives you four letters that make up your personality. Learning your MBTI profile is very helpful in understanding yourself, how you deal with others, ideal careers, and your strengths and weaknesses. Some organizations go as far as using the MBTI to assess compatibility with a spouse! The MBTI sorts people into 16 different personality types broken down by two pairs of cognitive functions. The cognitive functions are then broken down into 16 different personality types based on how the functions are paired with each other. After you take the test, you will be given one of the 16 different personality types which is expressed as a four-letter code. For example, based on the Myers Briggs Type Indicator (MBTI) personality test, I am an ESTJ with ENTJ close behind. Favorite world: What is the orientation of your focus and how are you energized? Do you prefer to focus on the outer world or on your own inner world? This is called Extraversion (E) or Introversion (I). Perceiving Characteristics (P) – Comfortable without details to act, likes to multi-task and have variety, tolerant to deadlines and time pressure, naturally avoid commitments which interfere with flexibility and freedom. Keep in mind these tests do not measure character, abilities or traits. The important thing to glean from the test is to understand and appreciate the differences in people. It also helps in self-awareness. I also have below the personality types that make the most money! You can download the test on pdf with the descriptions of each of the 16 different personality types below. It is quite extensive so take some time to learn about yourself and others! You can click below to download the test and results, or user the questions on the page below. It may be better to download it since it will be clearer. According to the Center for Applications of Psychological Type the chart below shows the breakdown of each of the 16 different personality types in the U.S. It is broken down by gender and total. The percentage shown below is the estimated percentage of people that have that particular personality type. Science suggests there’s one personality type that’s more likely to ditch the corporate structure and work for themselves. A new report from Truity Psychometrics, a provider of online personality and career assessments, found in its ranking of the personality types most likely to be self employed, extroverts took up six of the top eight spots. All of the introverted sensing types, on the other hand, were much less likely than average to report being self-employed. For example, 13.5% of ENTPs (people with a preference for Extroversion, Intuition, Thinking, and Perceiving) said they were self employed, while only 3.2% of ISFPs (people with a preference for Introversion, Sensing, Feeling, and Perceiving) reported the same. Molly Owens, CEO of Truity and developer of the TypeFinder® personality type assessment, says the finding speaks to what extroversion is and how it functions in the brain. She says this means extroverts are more likely to take risks, like striking out with a new business venture, because they anticipate more of a reward when things go well. Introverts, on the other hand, may be less interested in the risk of self-employment because they tend to be more even-keel, she explains, and aren’t as motivated by the potential for a thrill if things go well. There are also a lot of tasks related to being self-employed that play more to an extrovert’s strengths, she says. “Founders typically have to locate and pitch clients, hold regular meetings with employees, actively seek out networking opportunities, and do lots of other things that require them to be outgoing and expressive,” Owens says. “However, this is changing as more and more businesses move online. Introverts can really excel in areas like digital marketing, where they can take a more behind-the-scenes approach,” she adds. 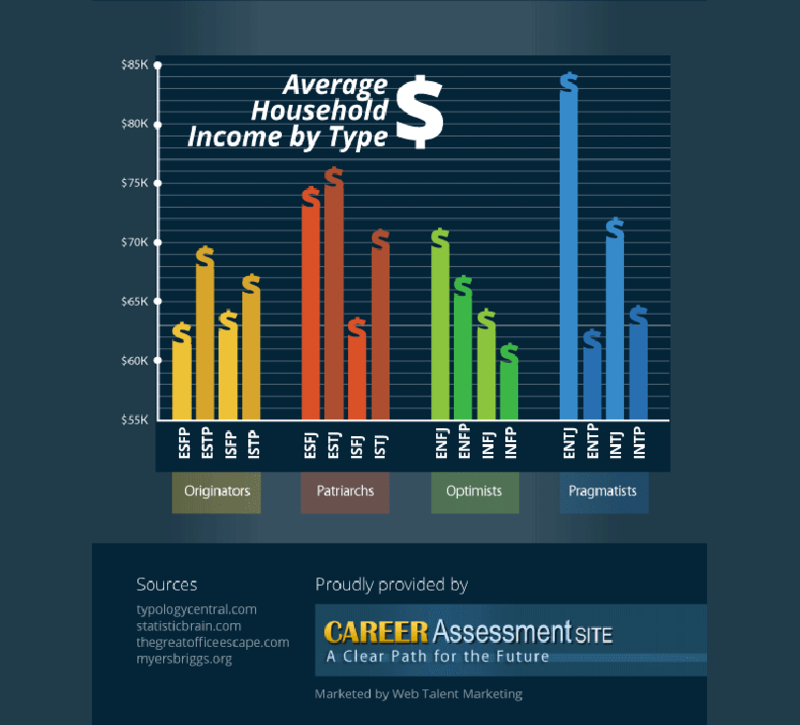 New data from Truity Psychometrics shows that your Myers-Briggs personality type correlates with how much money you earn. However, if you’re an introvert, your prospects of holding managerial roles are not hopeless. A study currently in progress in the U.K. has found so far that introverts in high positions at a marketing firm received equal performance reviews to extroverts and did not feel drained because their workplace has implemented “restorative resources” — quiet places to relax after giving presentations or participating in meetings. So, if you’re an introvert struggling through your weekly all-hands updates, the problem may be with your office rather than you. What the authors don’t explore is how gender, personality type, and wage are intertwined. Asking whether differences in income are due to personality or gender overlooks how personality is gendered. We as a culture cultivate more extrovert-like qualities, such as assertiveness and competitiveness, in men than women and then privilege these “masculine” traits when we seek people to fill leadership roles. It would be interesting to see future studies that, rather than trying to tease apart gender and personality as two separate factors determining income, explore how we may disadvantage women through cultural limitations on what personality traits they can demonstrate, as well as how we may disadvantage both men and women with “feminine” traits by associating “masculine” ones with leadership. And in a world where “who you know” matters more than “what you know,” this can be detrimental. He says it is important to note that these are “averages” and it does not mean that you cannot make a great living while having the INFP personality type.